"The Guard Attacks!”. The Imperial Guard, this glorious phalange, the fruit of the Emperor Napoleon's greatest attention, was almost an army within the "Grande Armée”. 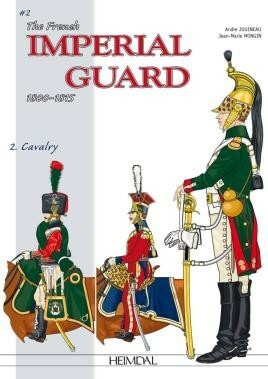 This study of the Guard's organisation, uniforms and equipment is fully comprehensive. Vol. I: Discover the uniforms, equipment and weaponry of the Old Guard, often the last resort to be thrown into battle at the decisive moment. The illustrator and researcher, André Jouineau presents here a fully comprehensive overview of all aspects, regiments, etc. of the French Imperial Guard. Vol. II Continues where vol. I ended with a wealth of images to conclude this fully comprehensive overview of the Imperial Guard. The level of detail throughout is first class and this would be a marvellous reference for your bookshelf for figure modellers, Napoleonic Wargames enthusiasts, artists and re-enactors alike. Highly recommended and a fine partner to the first volume dealing with the Foot Soldiers. ‘Beautiful' is really the only word I can use to do justice to this splendid book.